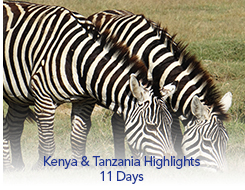 Experience the Masai Mara, considered by many to be Africa's greatest wildlife reserve. This is the adventure of a lifetime with a panorama of vast natural spectacle at every turn. The itinerary includes Africa's most fabled game parks including the Olduvai Gorge, an archeological site excavated by the Leakeys. "Without a Travel Agent, You're on your own."